Home » Blog » Did a judge impose a gag order on the Sandusky grand jury? 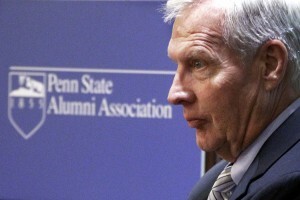 Penn State President Rodney Erickson has granted a number of interviews in recent weeks as media outlets across the country began marking the one-year anniversary of the Jerry Sandusky scandal. One story, published on Tuesday by Bill Schackner of the Pittsburgh Post-Gazette, particularly raised my eyebrows. Grand jury proceedings are secret, and those involved – prosecutors, jurors, judges and attorneys – cannot reveal what is said inside the grand jury room. But as Penn Staters know by now, witnesses can say anything about their experience. The law clearly permits Erickson to say anything about his testimony to anybody he pleases. But did a judge really tell him otherwise, and strip one of his few rights as a grand jury witness? Despite what the Attorney General’s Web site says, Pennsylvania allows judges to impose gag orders on witnesses for legitimate reasons that are “shown in a hearing before the supervising judge.” So it’s possible that prosecutors sought such an order sometime in the last year. If that’s true, I’m surprised it hasn’t been reported yet. But it’s also possible that Erickson needed a reason to dodge questions about the proceedings to shift focus away from the continuing investigation as part of his “moving on” initiative. By blaming the need for secrecy on a judge, he avoids looking like he’s hiding something.